In her first novel since 2002, Nebula and Hugo award-winning author Connie Willis returns with a stunning, enormously entertaining novel of time travel, war, and the deeds�great and small�of ordinary people who shape history. In the hands of this acclaimed storyteller, the past and future collide�and the result is at once intriguing, elusive, and frightening. Oxford in 2060 is a chaotic place. Scores of time-traveling historians are being sent into the past, to destinations including the American Civil War and the attack on the World Trade Center. Michael Davies is prepping to go to Pearl Harbor. Merope Ward is coping with a bunch of bratty 1940 evacuees and trying to talk her thesis adviser, Mr. Dunworthy, into letting her go to VE Day. 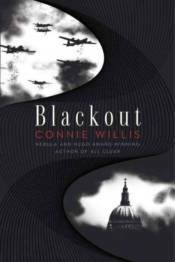 Polly Churchill�s next assignment will be as a shopgirl in the middle of London�s Blitz. And seventeen-year-old Colin Templer, who has a major crush on Polly, is determined to go to the Crusades so that he can �catch up� to her in age. But now the time-travel lab is suddenly canceling assignments for no apparent reason and switching around everyone�s schedules. And when Michael, Merope, and Polly finally get to World War II, things just get worse. For there they face air raids, blackouts, unexploded bombs, dive-bombing Stukas, rationing, shrapnel, V-1s, and two of the most incorrigible children in all of history�to say nothing of a growing feeling that not only their assignments but the war and history itself are spiraling out of control. Because suddenly the once-reliable mechanisms of time travel are showing significant glitches, and our heroes are beginning to question their most firmly held belief: that no historian can possibly change the past. From the people sheltering in the tube stations of London to the retired sailors who set off across the Channel to rescue the stranded British Army from Dunkirk, from shopgirls to ambulance drivers, from spies to hospital nurses to Shakespearean actors, Blackout reveals a side of World War II seldom seen before: a dangerous, desperate world in which there are no civilians and in which everybody�from the Queen down to the lowliest barmaid�is determined to do their bit to help a beleaguered nation survive.